In Ezra 4-5, we read of the opposition that the Jews faced in the rebuilding of the temple. We read of Cyrus, Darius, Ahasuerus and Artaxerxes as the kings in Persia. When Ezra jumps from Darius to Ahasuerus, is he jumping forward in history to the Ahasuerus and Artaxerxes that reigned from about 486-424, or are those titles for the son of Cyrus, Cambyses, who reigned immediately following Cyrus? Clarke suggests that these were titles for Smerdis, who reigned between Cambyses and Darius. Is there any way to figure it out conclusively? Ezra 4:5 states that the enemies “hired counselors against them to frustrate their counsel all the days of Cyrus king of Persia, even until the reign of Darius king of Persia.” At that point the record goes on to mention Ahasuerus (v.6), who is to be identified as Xerxes (see NAS ft. nt.). This is the Persian king who took Esther as queen (Xerxes reigned 486-464 B.C.). The next verse, Ezra 4:7, then says, “And in the days of Artaxerxes..,” who is the Persian king in the days of Nehemiah, cupbearer to the king (reigned 464-423 B.C.). Ezra 4:23 makes reference to a document of King Artaxerxes. So why are these kings who reigned after Darius (522-486 B.C., under whose reign the temple was rebuilt) mentioned here? It seems the best answer is that the current opposition which stopped (for several years) the rebuilding of the temple furnished the occasion for the writer to list similar efforts made by enemies of God’s people to hurt and halt His work including the rebuilding of the walls of Jerusalem. As Fensham noted, the author “is referring in this chapter in chronological order to the hindrances placed in the way of the Jews to rebuild the temple and the wall of Jerusalem. When he discussed the problems of the building of the temple in 4:1-5, it reminded him of later similar troubles with the rebuilding of the wall of Jerusalem, and so 4:6-23 has been inserted, almost parenthetically, before the argument of the building of the temple has again been taken up in 4:24ff) (The New International Commentary on the Old Testament: The Books of Ezra and Nehemiah, p.70). “…the author of this chapter enumerated the different hostile actions against the Jews…” (ibid.71). This explanation was earlier given by Keil in the 19th century (Vol.4, p.46), who went on to say, “v.24, so far, then, as its [subject] matter is concerned, belongs to the following chapter, to which it forms an introduction (ibid.47). The Oriental Institute Museum has an impressive collection of Persian artifacts which relate to the biblical period. Bull from Palace at Persepolis. Dates to Persian Kings Xerxes and Artaxerxes I. Photo by Leon Mauldin. Paris of guardian figures commonly protected the entrance to important buildings in the ancient Near East. This highly polished stone head originally belonged to one of two guardian bulls flanking the portico of the hundred-column hall at Persepolis. 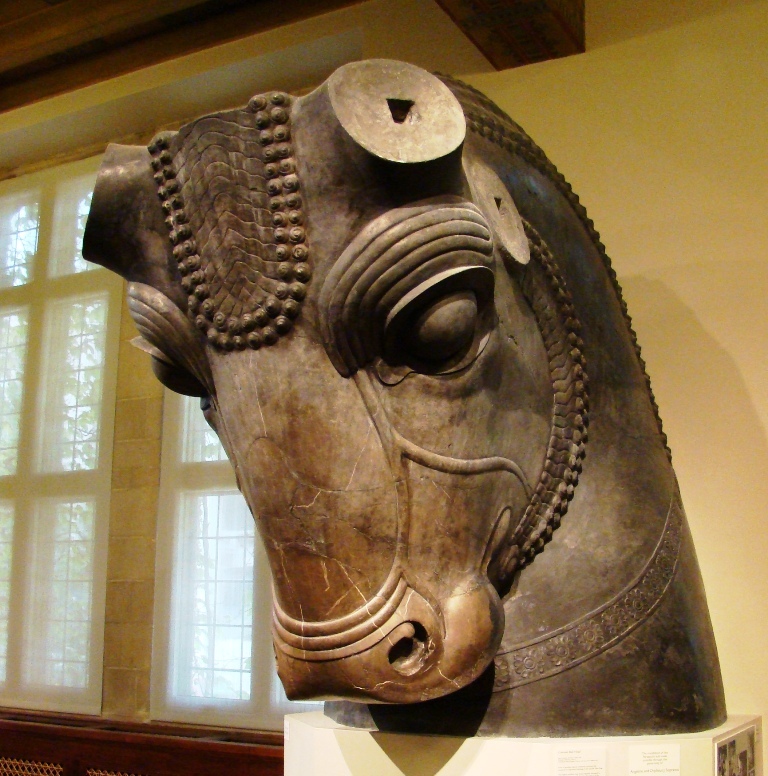 [This head] which weights approximately ten tons, was transported to Chicago and restored by Mr. Donato Bastiani, a member of the Oriental Institute Museum technical staff. The two bulls were carved in the court style typical of the Achaemenid Empire. The ears and horns, which had been added separately, were not found. This entry was posted on Thursday, May 3rd, 2012 at 8:06 AM and is filed under Bible History and Geography, Bible Study, Biblical Interpretation, Old Testament, Persian Empire, Travel. You can follow any responses to this entry through the RSS 2.0 feed. You can leave a response, or trackback from your own site.